The AKE Cruiserweight Championship is a professional wrestling championship promoted by Azteca Karate Extremo. It was established in January 14, 2017. Impulso is the current champion. The AKE Cruiserweight Championship was introduced in 2017 by Azteca Karate Extremo. Bestia 666 became the inaugural champion by defeating Garza Jr. in Tijuana. 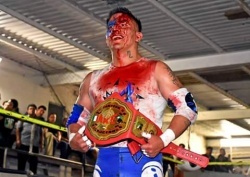 Aeroboy became the second champion defeating Bestia in his first title defense on October 20, 2017 at Gimnasio Oscar "Tigre" Garcia in Ensenada, Baja California. Extassis was the third champion after Aeroboy. This page was last edited on 3 March 2019, at 01:37.